Convalescent homes are proving really difficult to find out about. They were often privately- or independently-run or an add-on to a hospital which could be in a town or city many miles away. I am finding that records from these convalescent are generally very difficult to track down. They may have been destroyed when the homes themselves closed as there was no central body to take care of them and no legal imperative to save them. Another problem with locating convalescent homes is that many were very small – perhaps only six or eight children at a time – and there were many of them particularly in key ‘convalescent hotspots’ such as Broadstairs in Kent and perhaps North Devon. However convalescent homes themselves were very popular places to send poorly, or disabled children in the first half of the twentieth century. They were often by the sea as the sea air was thought to have great recuperative benefits, they were generally in the countryside. Children were encouraged to get fresh air and exercise and usually had some sort of schooling during their stay which could have lasted for months or even years. Depending on who ran the convalescent home, the costs of the child’s stay could have been borne by the parents, local charity / philanthropy or paid for by the Poor Law Union where the child lived. In the case of the latter, it is possible that archives of the Poor Law Unions may include records of these payments or the committee meetings which relate to them. Ray has been researching convalescent homes in a small area of North Devon as he knows that he spent time in one as a child but has few clues about whereabouts it was. Broomhayes Manor Convalescent Home Situated in Westward Ho!, this was a Nursery in the 1940s and later a convalescent home. A bit more about it here. Webbery Manor Convalescent Home former manor house near Alverdiscott. 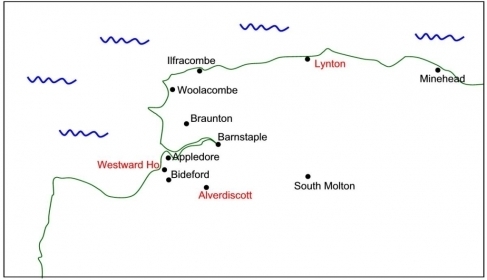 We think Webbery, Bideford, was founded in around 1938 and closed in perhaps the 1950s or 1960s. Newspaper adverts relating to this home can be found on the right hand side of this page. Lynton Children’s Convalescent Home Ray has found that this home, called Clooneasvin, was converted from a convalescent home into holiday flats in 1964.There are inspection reports relating to the home in the collections at the National Archives in Kew. These inspections relate to the fact that the home had children being schooled there, and were carried out by the Inspectors of the Ministry of Education who were responsible for these ‘special schools’, and that is why the records survive with other central government records at the National Archives. The reports seem to date up to 1950 and would probably give a description of how the home operated. We believe the Lynton Home to have been opened in 1924 - see the newspaper articles below right. Sadly Ray hasn't been able to locate any records which could tell him which home he was in, or any more information about any of the convalescent homes to enable him to recognise one. Photographs seem to be pretty much non-existent! We are trying to find out more about Lynton Children’s Convalescent home in Devon? My father in law Albert Saunders was sent there aged about 3 in 1918. He suffered was rickets, was illegitimate and born in lslington workhouse. It appears that he was abandoned in the workhouse and sent down to Devon from London to recuperate. He was fostered from the home into a family called Marks who lived in Gittisham, Devon, to be a companion for their daughter. Does anyone know anything about Lynton Children’s Home, and who ran it? Was it a church, or charity? Was it normal for a child to be sent so far away from their birthplace? Any help would be much appreciated. Thank you. If anyone can shed any light on the convalescent homes of North Devon for Ray or Deborah, please email me. Many thanks! 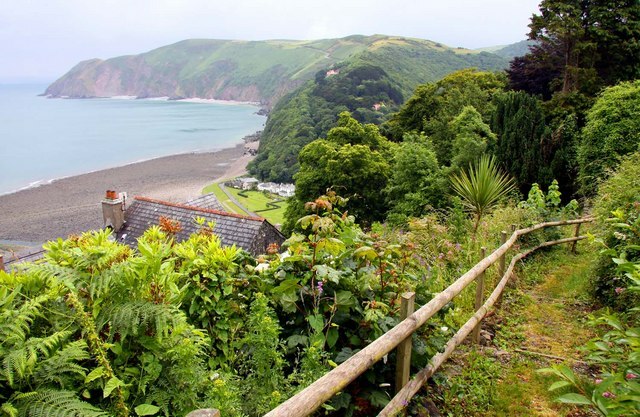 A view of Lynton, North Devon. Photograph by Steve Daniels for the Geograph.org.uk project. This file is licensed under the Creative Commons Attribution-Share Alike 2.0 Generic license. This quote is from Wiki: "In 1950 local businessman J.H.Leonard Lloyd bought [Highcliffe Castle, Dorset] from the Stuart Wortley family to turn into a children’s convalescent home. Having already founded a similar home in Lynton, North Devon, he charged four guineas a week. Within a year, media allegations of the indecent assault of children led to a subsequent court case, which although dismissed resulted in the home's closure." Mr. W. Carter presided over Saturday’s meeting of the Crediton Board of Guardians. There was little business of general interest. Letters were read from Mr. R. Living of Lynton with reference to founding a convalescent home for children at Lynton. It was stated that it was proposed the Home should provide accommodation for about 36 children and, as a start, to equip it with 20 beds. Mr Living offered the house and grounds with £500 a year towards its funds. The Guardians were asked to furnish an approximate number of children they could send to the Home. The Clerk (Mr Seymour Pope) said he had inquired as to the charges that would be made for the maintenance of children at the Home and had received a reply to the effect that it was not yet possible to announce this until it was known how many Boards were likely to send children and what what number of children were likely to be sent. The Chairman said the Crediton Board had children who could be accommodated in such a Home and there would undoubtedly be enough to fill the Home easily from Devonshire. The Clerk was directed to reply that the Guardians were in favour of the scheme but desired to be furnished with further information. Lord Portsmouth has consented to open the Lynton Children's Convalescent Home if a convenient date can be arranged. Dr Candler, of the Ministry of Health, has made an inspection of the Lynton Convalescent Children's Home for certification and recognition. 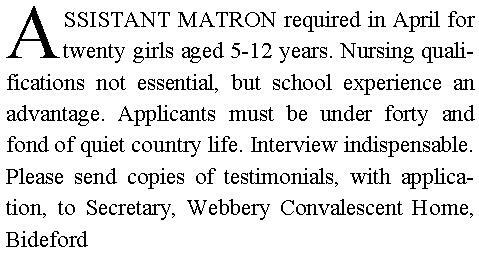 It is a very intersing fact that the North Devon Convalescent Children's Home is still full up and doing really excellent work for the little ones, also it is most gratifying to learn that North Devon is deriving great benefit from the existence of the home, for we are informed that about half the beds are at present accommodating children from various parts of the North Devon area whilst others have come from Porlock, Miinehead, Bristol, Croydon,, London &c. There is, however, a great demand for their beds, which is in itself a spendid testimony of the efficiency and good management of the Home for even this time of the year there is a fairly long waiting list of little sufferers waiting for vacancies. Owing to this great demand, the founder, Mr. R. Living, FSI, MRIPH (who is personally superintending the Home), together with Col. White and Major Wilson OBE has decided to extend the premises, and make accommodation for some 70 or 80 beds, which is estimated to cost some £5,000, at the same time it is purposed to bring the Home more up-to-date and to fit a complete installation for the Ultra Violet Ray Treatment (artificial sunlight). This treatment has, however, been carried on by the founder for some months and remarkable results have been effected thereby. This not only greatly increases the general metabolism of the body and increases the appetite, but is powerfully bateriacidal, thus all complaints have been treated and have responded very favourably. Since the institution opened some 17 months ago, there have been 83 patients treated most of whom have stayed between 4 and 6 months, and ever since last spring there have been candidates waiting for vaancies. The average gain in weight of most of the children has been over half a pound weekly and this week gains have been recorded of 2lbs and 3lbs in some cases.